The effect of sepia in a photo is certainly familiar to many modern photographers that have at least some years of experience. These photos are a little brownish with a look of antiquity that lets people think that such images were made many years ago. Today professional retouching has many ways to add this special effect to the photos. One of which is using Lightroom sepia preset, which is considered to be one of the most effective ways at the same time. This effect after sepia Lightroom presets is well suited for improving portrait, wedding, street, urban and landscape photographs. 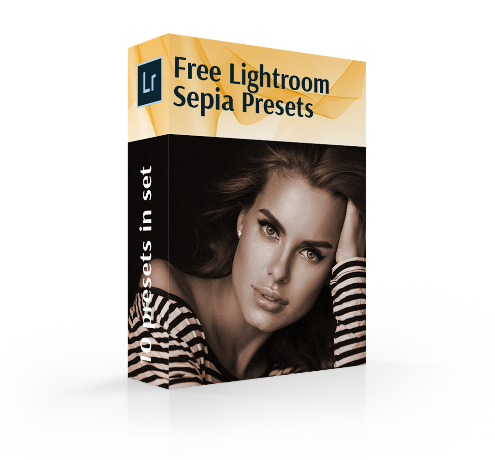 Professional photographers of our company have developed a set of sepia presets for Lightroom that will give various effects of matte, HDR, vignette, soft contrast and many more. Concerning photo retouching the sepia technique achieves a very beautiful color that reminds the color of dry autumn leaves. Our Lightroom sepia presets are suitable for toning pictures in brown, adjusting the intensity of the color and achieving soft or deep tones. Depending on photographers’ wishes sepia presets Lightroom may be combined with retouching of all photo genres. Every retoucher will find something interesting in such Lightroom effects that can be adjusted to your photographs. Sepia is the most popular effect that imitates antiquity, vintage and retro style. Only several simple clicks in order to activate any free sepia Lightroom preset substitute the laborious procedure of turning modern photos into vintage samples. For this ability Lightroom sepia presets are selected so frequently. LR preset #1 "Deep Shadows"
LR preset #3 "Soft Skin"
LR preset #6 "Cold Shadows"
LR preset #9 "Old Style"
Free Sepia Lightroom Preset – How to Choose? In case you want to get photos that are emotional and nostalgic, this bundle of sepia Lightroom presets that contains old-style plugins, will become an indispensible part of your retouching procedure. Our collection includes only carefully made sepia presets for Lightroom. All professional plugins have been specially designed with taking into consideration all needs of contemporary photographers before being presented here. Recently the number of trends has been increased. Among them using Black & White and sepia presets Lightroom has never been ignored. For this we advise to consider their advantages and grab them. Every Lightroom sepia preset is simple in using. While dealing with such plugins you will not need to find instructions or spend hours in order achieve satisfactory result. The only thing you will require is one click on your laptop. In case you want a unique result, you may adjust your personal settings of chosen free sepia Lightroom preset or customize it. That will be a possibility to check your creativity. Preset Lr Free Sepia #1 "Deep Shadows"
The plugin brings dramatic texture to pictures that have been retouched with its help. This Lightroom sepia preset is focused on emphasizing details and raising contrast during its applying. Judging from the choice of experienced retouchers filters suit ideally to men`s portraits and photos of architecture or landscapes. It may be combined with those pictures that require solid underlining of details and unusual texture. Sepia Lightroom Preset #2 "Matte"
These sepia presets Lightroom retouch pictures in another way. After them retouchers get totally clear pictures that are enhanced by high contrast. The described peculiarities work well with street photography. This style is divided into lifestyle portraits, pictures of architecture and varied urban landscapes. With every photo type sepia presets for Lightroom will show effective result. Lightroom Sepia Preset #3 "Soft Skin"
The focus of the free sepia Lightroom preset is revealed in its name. The algorithm of its work is to manipulate photo colors so that they become cleaner. All this is possible without long wasted hours of retouching. Everything changes within one click. After applying this filter, all settings can be individually adjusted. Free Sepia Lightroom Preset #4 "Sharpening"
A professional sharp effect is achieved after using our sepia Lightroom presets. Plugins with the focus on sharpening improve pictures in two different ways. They add life, so that images turn out to be natural and with no artificial hints of retouching. The sepia presets Lightroom increase dynamic range of photos. Lightroom Free Sepia Preset #5 "Memories"
These beautiful sepia Lightroom presets brighten images giving emphasize to the general impression, but not to the small details. Plugins also give punchy and slightly vigorous look that suits ideally for street pictures. The effect is completed by a medium vignette that makes photo edges darker and the center lighter. Lightroom Preset Sepia #6 "Cold Shadows"
Lightroom sepia presets with this effect work flawlessly with all photo types. We may enumerate portraits, landscape, street, fashion, travel and many other photo styles. The only peculiarity is that such plugins work with those pictures that are abundant in shadows and dark tones. Moody landscapes with cloudy sky will be ideal for such plugins. Preset Lightroom Free Sepia #7 "Darken"
Sepia presets Lightroom replace common monochrome black and white coloring with a highly stylish vintage look that cannot be named as an old-fashioned one. With this plugins easily bring out emotions of every picture. LR Free Sepia Preset #8 "Pure"
Such Lightroom presets raise photo contrast and preserve natural look of person`s skin. A good look will be achieved at various types of photos. They are the most frequently used with portraits, animal pictures, landscape images and still life photography. Preset Lightroom Sepia #9 "Old Style"
This Lightroom sepia preset gives a photo an old look. The contrast will not be strongly emphasized. It is combinable with all photo genres. The outcome will be completely different, but in all cases satisfactory. Free Sepia LR Preset #10 "Contrast"
A beautiful Lightroom sepia preset that creates an HDR effect on your pictures. A similar plugin can become indispensable in the professional workflow of a landscape/nature or just a beginner photographer that want to develop himself/herself. The unique feature of the free sepia Lightroom preset is that it creates no noise or high contrast during retouching. All Lightroom sepia presets that have been presented in the following collection are the result of a time-taking work conducted by experienced professionals of FixThePhoto service. The fact of their thorough creation opens possibility for using them with any kind of contemporary photos. Select a Lightroom sepia preset that approximates natural features of professional pictures the most closely. For example, for a photo landscape Lightroom sepia presets of a grayish-brown hue are the best for selecting. And for a portrait or a naked body, there is a flow of reddish sepia provided by designed sepia Lightroom presets. If you want to give your work colder shades, use a cold shadows Lightroom sepia preset. The contrast of cold and warm flow also gives a characteristic charm to photos. Try soft contrast and effective light sepia presets for Lightroom.